Before describing this weird and wonderful bar in a small town 30 miles southeast of Portland, I feel obliged to offer a personal note about, well... the future of mankind. My personal view is that as of the late 20th and early 21st century, big game hunting for sport is an atavistic, and borderline neurotic activity. I don't seek to impose that view on others (beyond protecting endangered species), but it seems fairly clear to me that society is moving increasingly to embracing this view, and that at some point in the future the common view will be that such activities are aberrant symptoms of a possible sociopath, comparable to our view of someone who violently beats their dog. That is while humans once felt that watching wild animals kill and eat humans in a coliseum was a delightful sort of entertainment for adult and child alike, as they once believed it was bemusing to hang a caged cat over a fire and listen to its howls as it fried, and as they once thought it unthinkable that society or neighbors should interfere with how a man might choose to beat his own animals, the general extension of human compassion to ever larger groups of humans and other sentient beings changes what we find acceptable over the generations. That said, I don't think we should impose these values upon the past, and we certainly should not seek to avoid reality -- realities such as the natural role hunting has played in history of mankind, or that the fate awaiting many big game animals in the wild was much more savage and painful than a bullet from a hunter's gun. 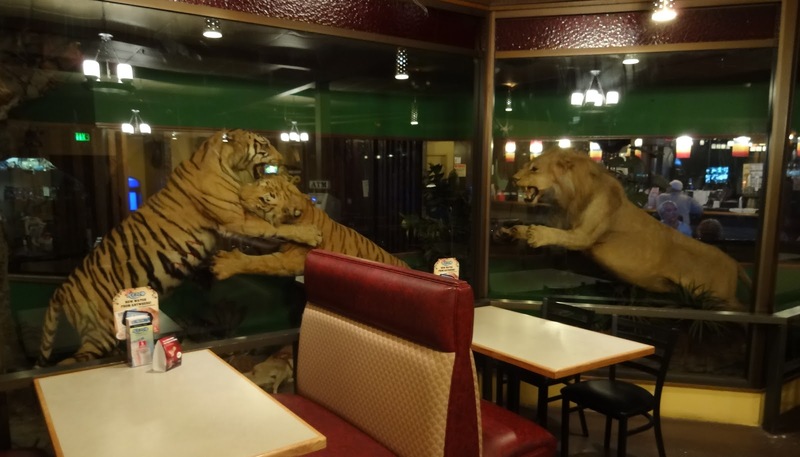 That savagery, along with simply the extraordinary range of wildlife around the world, is the major theme of the "Legendary Safari Club" in Estacada, Oregon. And while I might not support a newly created place like this, I am delighted that some new owners preserved and restored this one. 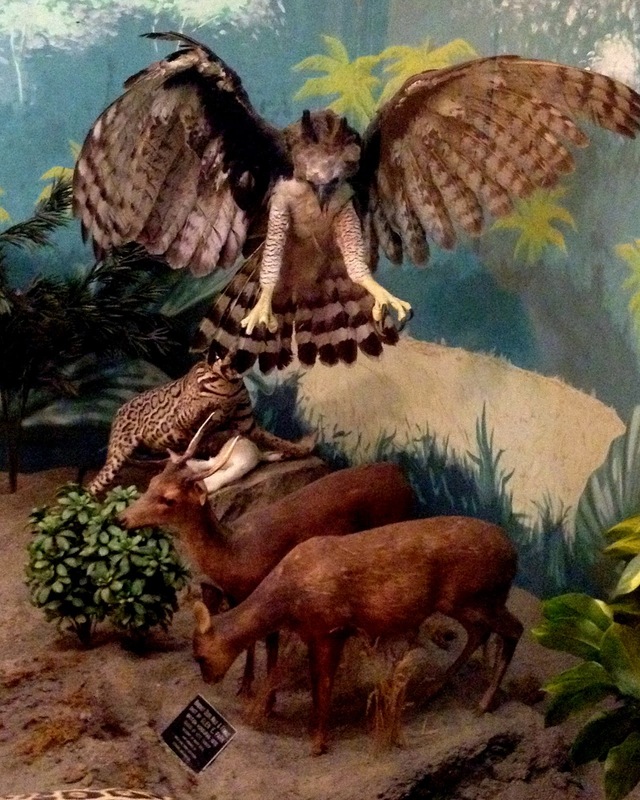 The Safari Club is a restored wonderland of taxidermied animals from around the globe. 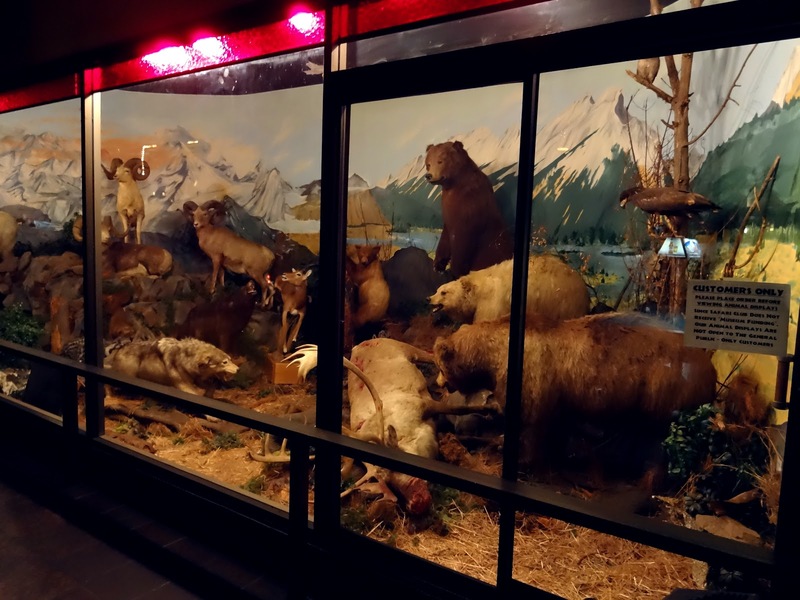 Most of the animals were the property of famed hunter and Estacada resident Glen Park, who sold his lumber company and built the place in 1970 to display his trophies from 23 hunting trips in 6 different countries. The animals are arrayed in several very large displays, and with an emphasis on predation. 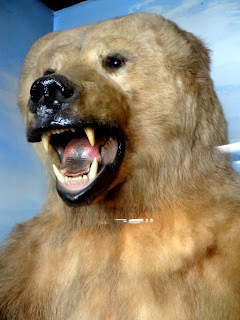 Most the large exhibits include faux blood running from the gashes of some unfortunate beast become a meal. 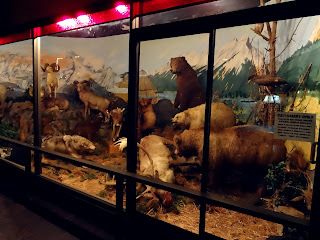 Full size polar bears (yes, plural), every kind of bear, lions, tigers, buffalo, big horn sheep, hyenas, a mountain goat, a muskox, moutain lionso, elk, on and on -- they attack their prey in natural museum quality displays, leap out from over the stage, stalk each other around the bar. The club claims this is the only place of its kind in the world, and it is easy to believe. 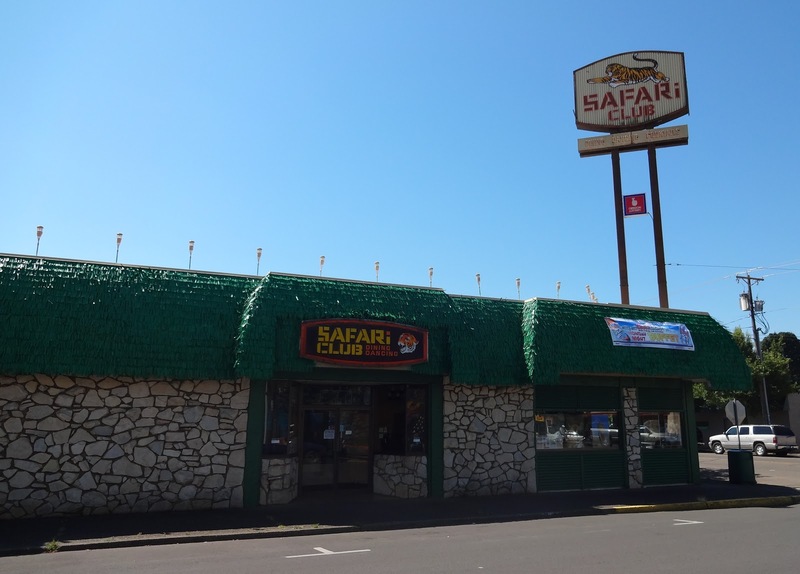 "During the '70s and well into the '80s, the Safari Club boomed under the management of Park's son, Mike Park. Residents recall the packed dining room, the dancing and live music, and the lounge waitresses dressed in leopard print uniforms." (oregonlive) But as the lumber industry in the area died out, business waned. It became a Chinese Restaurant -- the Jen Jen Safari Club, and the Hong Kong Lounge. The animals were increasingly damaged and gradually removed from view. 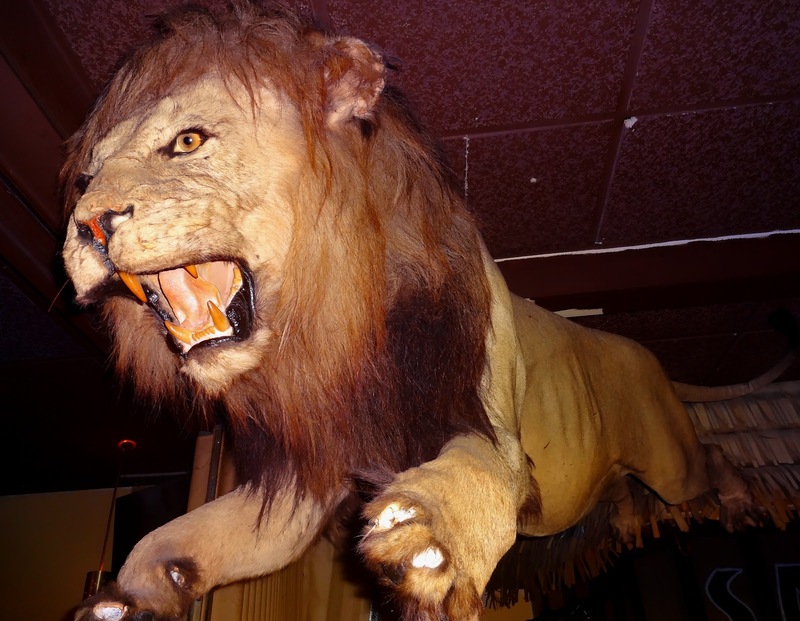 In September 2011, business partners Cindy Smith and Betsy Clester purchased the club, and after preventing the animals from being sold out from under them, restored the taxidermy and displays, and reopened that October. The drinks and food are pretty average, but unless you live in Estacada, this is entirely beside the point. 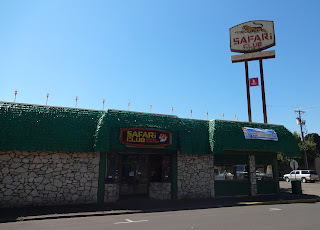 Despite many trips to the Portland area and friends in the area, I had never heard of the "legendary" club until I won a free dinner there in a tiki event in August 2012. It is basically out in the middle of nowhere but such an extraordinary stop that it is well worth the drive for anyone living or visiting in northwestern Oregon or southwestern WA.